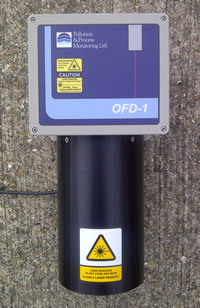 The OFD-1 is an oil film alarm system providing in real-time measurement. The no-contact monitoring system comprises a weatherproof sensor and a separate controller with local display which provides telemetry outputs. The oil film detector may be integrated alongside a number of water quality instruments such as pH, conductivity, DO and TOC to identify pollution and prevent release to local water courses. 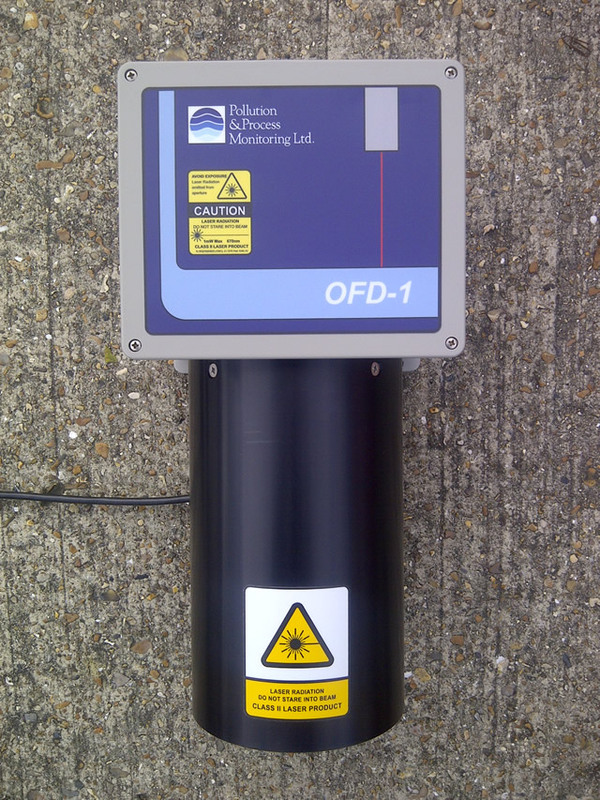 The OFD-1 Oil Film Detector is a simple, compact, on-line instrument designed to reliably identify the presence of a floating oil film. The continuous, non-contact measurement technique provides real-time alarming and control functionality. The instrument comprises a wall-mount controller/display section with an integral membrane keypad and back lit LCD, which interfaces with a sensor. The sensor is positioned over the water body (or within a concrete bund) or alternatively over a sample breaktank receiving a pumped sample. The non-contact laser is focussed onto the water surface and when a fine film of oil appears, the increased reflectance is measured by the sensor. Consequently the technology responds quickly to an event and immediately recovers once the event has passed. OFD-1 Oil Film Detector Low cost, contact-less measurement technique used to identify and alarm floating oil films. All materials or substances have a different refractive index. Consequently, when a light beam of known frequency and constant intensity, is focussed onto a water surface, the increased reflectance associated with an oil film can be measured relative to clean water conditions. The instrument processes and averages the signal, to take into account natural signal variations caused by ripples on the water surface or slight changes in the water body. The user is able to configure a suitable alarm set point by presenting a discrete sample (containing oil) to the sensor and changing the sensitivity of the alarm set point (within certain tolerances). The OFD instrument is suitable for continuous measurement of cooling water discharge or to monitor abstracted river water, to prevent ingress of oil into drinking water production sites. The technique provides high sensitivity and is capable of identifying near trace level oil contamination. The instrument is not designed to identify gross contamination (mm thickness) found within oil-water separators.